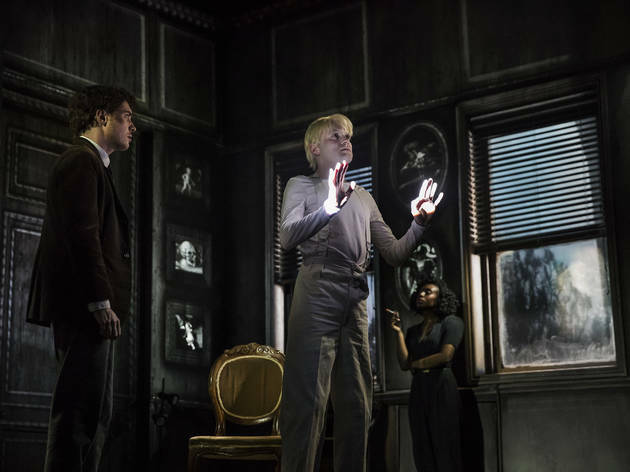 If you haven’t heard of Paul Auster’s 1987 cult novel ‘City of Glass’ (and until I saw this show, I hadn’t) it’s a tough one to summarise in any kind of pithy fashion. 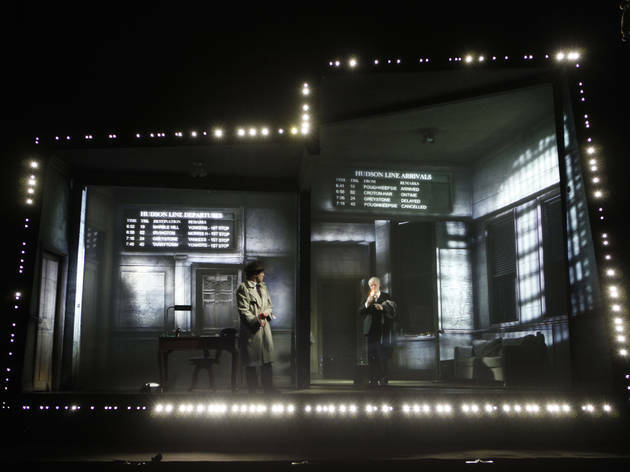 It’s kind of a detective story, but it quickly fractures into mind-boggling layers of reality – and director Leo Warner’s dazzling hi-tech staging picks up and polishes every shard. It’s totally different from anything else you might see at the theatre. Its inspirations come from the world of comic books and hard-boiled detective fiction, mixed with a hefty dose of literary heavyweights like Cervantes and Milton. So it’s not the show to come to for 3D, rounded characters. Accordingly, its protagonist Daniel Quinn is a vaguely tormented everyguy, a crime writer who’s struggling to find meaning after losing his wife and kid. He finds it in a real-life case that lands in his lap: a man who spent his childhood trapped alone in a dark locked room, Kaspar Hausar-style, needs his help. As Daniel Quinn takes on multiple identities in search of some kind of truth, the world around him dissolves from hyper-real, noir-ish New York street scenes into hallucinogenic swirls of galaxies or into densely-scribbled-on notebook pages. Jenny Melville’s set design and Lysander Ashton’s graphic novel-inspired video projections create a subjective city-scape that’s completely engrossing. Duncan ‘1984’ Macmillan’s adaptation doesn’t shy away from the meatier ideas of Auster’s novel: describing it, you could definitely bandy round words like ‘postmodernism’, ‘psychogeography’ or ‘poststructuralism’. But you don’t need to. Because really, it’s a story about being adrift in a world that defies explanation, and that’s something pretty much everyone can identify with right now. Quite the most pretentious work I have had the misfortune to sit through in many years. The evening was 100% style over content. 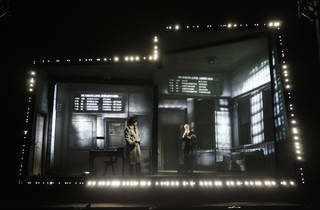 The set design, video projection and accompanying audio effects are fascinating and compelling. Oh that the same could be said for the script and performances. I am not surprised that there was no interval - had there been then we and those sitting around us would not have returned for the second half. I write as someone who has worked in production for my entire career and am so sad that the Lyric housed this production. The one star I have given is for the staging. I would have given that aspect of this appalling evening 5 stars had there been a separate category for it. The night that we were there, when one of the actors came on stage and talked directly to the audience about the principal character's jottings in a book becoming increasingly meaningless, his words caused unintentional guffaws of mirth from the audience as he was also describing the play itself. 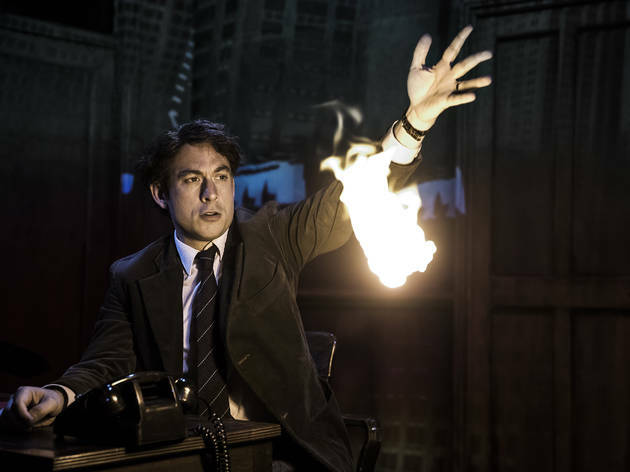 City of Glass gets you into the theatre by pretending to be a type of film noir story, but after you have been watching for about ten minutes, you realise that it is attempting to be something deeper and more challenging. This is a problem, because when you go in expecting a nice murder mystery, you may not be in the right frame of mind to consider the slipperiness of language and people or what it means to be you. 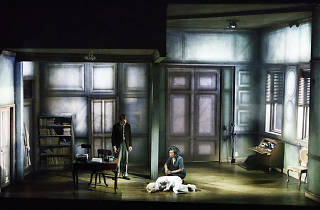 I found the dialogue too oblique to follow easily and I felt like each person was speaking in a vacuum rather than interacting with the other characters on the stage. 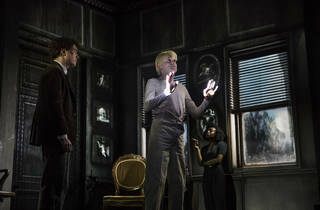 This was a shame because the set design, direction and cinematography was among the best I have seen on a theatre stage. 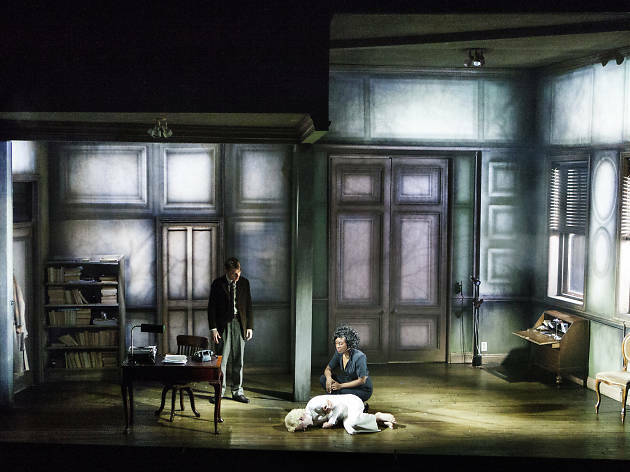 Paul Auster's strangely compelling, noir-tinted book is brought to life in this production that is clever, entertaining, and baffling by turns. 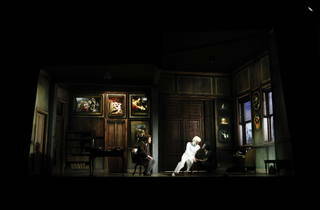 The set design is a marvel in itself, incredibly well put together and a visual feast for the senses. 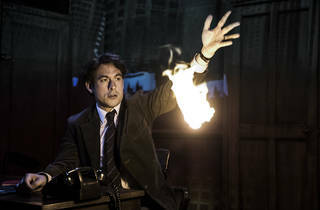 If you haven't read the book and enjoyed it, City of Glass may not be for you - the existential, Kafka-esque nature of it can be alienating for some - but as a huge Auster fan I felt that this production certainly did the novel justice, and then some. The production design is dazzling and flawless. I've read the story before and I can see why some would feel it's a little style over substance though I personally did enjoy it. I'd agree that that there's perhaps a lack of emotional engagement with the characters at times but I think there's enough in here to provoke thought, keep you entertained and provide a unique and memorable experience. Check out the accompanying VR film in the bar area too. This sounded so promising with a slick & intriguing concept but was let down by a confusing & non coherent plot line with eccentric & characters I couldn't engage with. 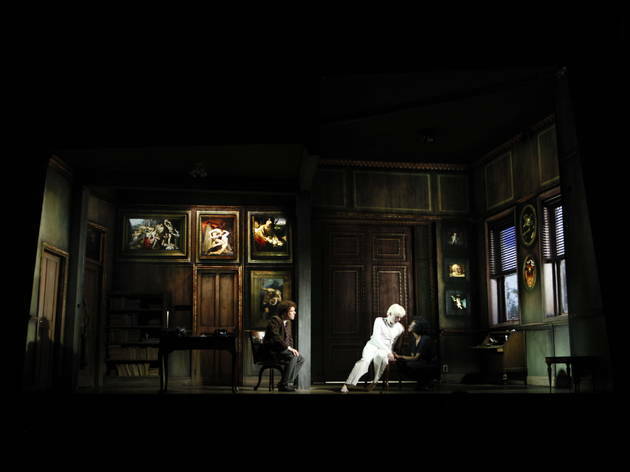 The set is clever & the 2 star rating is for that & the quality production. There is no intermission which in my experience is often a bad sign. It felt too long & after a bizarre angst ridden monologue by the lead character who has descended into madness there was an odd & gratuitous epilogue scene. I didn't get this play at all & felt relieved to escape after the final curtain.